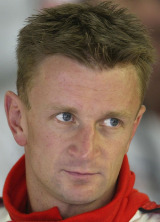 Allan McNish devoted his time to pursuing an F1 drive, but while that only briefly came about, he forged an excellent reputation in sports car racing, and became a two-time winner of the 24 Hours of Le Mans (1998 and 2008) and a two-time American Le Mans Series champion. He gained tests with McLaren and Benetton while competing in Formula 3000 between 1990 and 1995, and from 1996 he switched to sports cars. Ironically, his F1 chance came after he ditched F3000 when he was signed by Toyota in 2001 as a test driver as it prepared to make its F1 debut the following season. He did well enough to secure one of the team's two seats, but he failed to score any points in his 17 grands prix in 2002 and both he and Miko Salo were replaced at the end of the season. He came close to success in Malaysia but was let down by a pit-lane mistake. In 2003 he was a test driver for Renault and also did some work for ITV before returning to sports cars, and in 2005 won Sportscar Driver of the Year awards from the Autosport and Le Mans magazines.